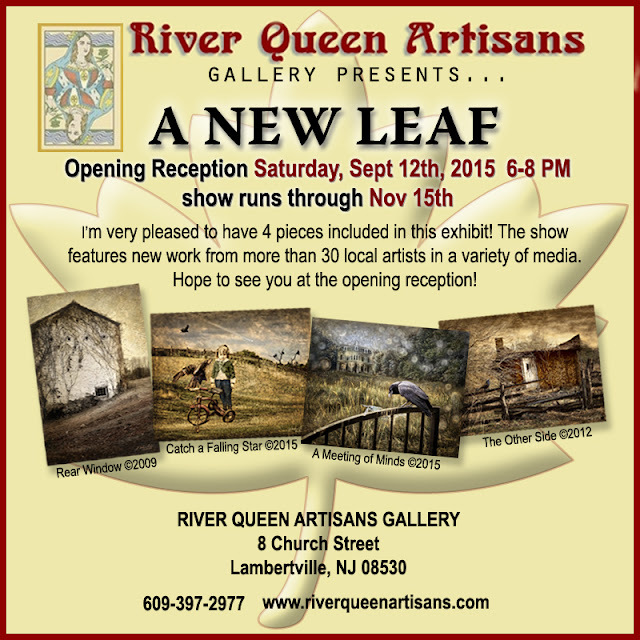 "A New Leaf" opens at River Queen Artisans Gallery! 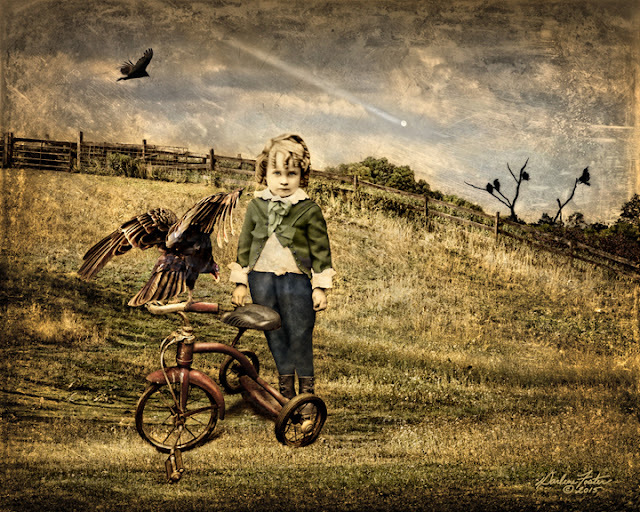 A Meeting of Minds ©2015 - This montage began with an image I captured in the area of Califon, NJ of a magnificent crow. He was perched on the gate of a large property and when I focused my camera on him, the resulting image had wonderful bokeh in the background. In photographic terms, "bokeh" has been defined as "the way the lens renders out-of-focus points of light". It was softly out of focus with beautiful orbs of light floating all around. I added a field of swampy grasses with a few cattails from Warren county around Belivedere, NJ. 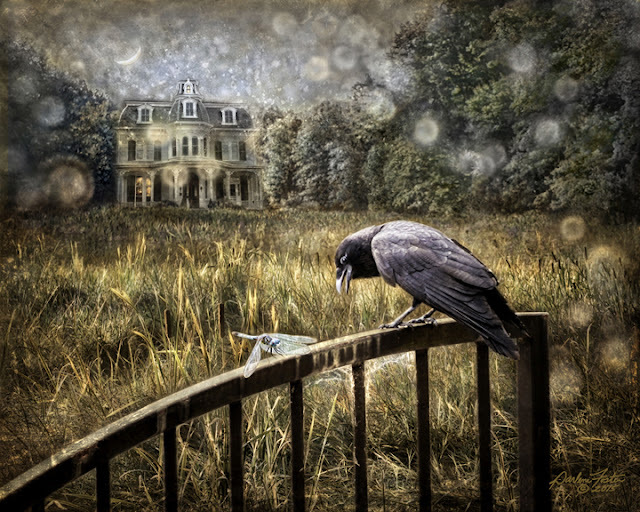 In the distance, I placed a photograph I captured of the lovely Mansion Inn in New Hope, PA. Charles Crook, a local businessman, had the house designed and built for his wife in 1865. The intricate Victorian scroll work gives it a magical air that fit the composition perfectly. When I blended the images together, the orbs of the bokeh seemed to be emanating from the house like spirits dancing in the moonlight. Last but not least, a graceful dragonfly I found sitting atop a plant just outside my back door was added and, hopefully, is having "A Meeting of Minds" with the crow regarding sharing the dance floor. Catch a Falling Star ©2015 - The camera is an amazing tool, but it can be magical when the unexpected happens. I was in Stanhope, NJ just around sunset one evening photographing a flock of 13 vultures (6 of which are included in this piece). They were gathering in a cluster of bare limbed trees to roost for the night. When I downloaded the images, I noticed a streak of light in one just above the trees. Thinking it must be the trailing of a jet plane, I was surprised and thrilled when I enlarged it to see it was a round, glowing object with a faint, textured center. I had inadvertently captured a meteoroid entering the earth's atmosphere! Knowing I had to use it in a piece, I chose a background image of a sloping field with a wooden rail fence and lovely evening light from Stockton, NJ. I removed the tall, wooded area that was beyond the fence and replaced it with a sky of rolling clouds to showcase the star. I came across the little red tricycle at an antique shop in Red Bank, NJ. It was a little impractical to purchase as a prop, but I did sneak a couple of shots that turned out to be usable. I placed it, along with the young gentleman (from my vintage photo collection), and the landing vulture in the field. I then added color inspired by one of William Heath Robinson's watery, pastel paintings to try to attain the soft, golden glow that evenings have at the end of summer along with some texture from a daguerreotype. One legend has it that seeing a shooting star can mean bad luck or even death. Another says good luck and a wish made upon it will come true. I prefer to believe the latter and feel lucky that I was able to "Catch a Falling Star".